An article in the NY Times reports on a recent research about Direct-to-Consumer drug marketing. The article draws attention to authority and power of a “survey” in convincing consumers to self-diagnos and to request particular drugs. Dr. Jayne’s Almanac—Patent Medicine Propaganda by a local, Philadelphia company. All this sounds a lot like the techniques used a century ago to market patent medicines. At that time Muckraking journalism helped expose an industry that was probably not helping anybody and might actually be harming many consumers. In Markting Drugs Then and Now I draw out some of the many similarities between the two eras. 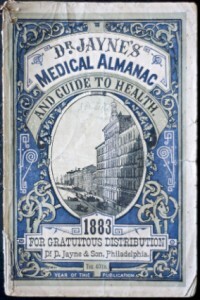 There are a number of related posts on patent medicines linked to from that post.